Sweet Mincemeat is so easy to make and so much tastier than the ready made that I don’t understand why anyone would not make their own. Also when you make your own you can control the amount of sugar in it. I find most commercial food products that are sweet have increased the proportion of sugar over the last few years. I am a great believer in using either what you have or can get hold of locally. Frequently this can point you in the direction of improving on an original recipe, as is the case here. The limes giving the mincemeat a fresher and slightly more acid citrus zing than the lemons that are normally used. 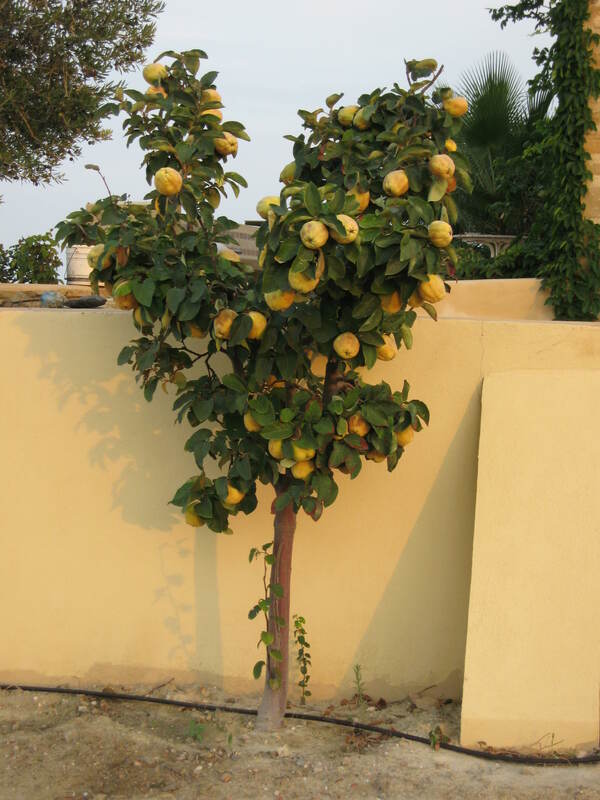 I only have one small quince tree, but it works incredibly hard and produces 40 to 50 fruit per year, some weighing as much as 800 grams. They made fabulous quince jelly, and using an old recipe where the fruit is sweetened with raisins and flavoured with orange peel, Mermelada. This being the Portugese name for quince and the recipe being the forerunner of the marmalade we know today. Still there were plenty of Quince left for other things. Being of the same family as apples, surely I thought, they could be substituted for them in any preserve recipes? And of course I am always looking for new ways of using my limes…..
Firstly find yourself a container big enough to comfortably take all of the above. For the limes, having a lime farm, I am able to wait until my limes are fully ripe quite yellow and sweeter than the hard green ones generally available. If when buying your limes some of them are more yellow than others, go for those as they are sweeter. If you can find unwaxed ones so much the better. Wash them then put them in a pan with just enough water to cover and bring slowly to the boil. Simmer for an hour until tender. Drain the limes and let them cool. Halve them and remove any pips. Put them in the food processor and process them into a coarse pulp. Put the pulp in your container. Next the quince. Peel and core the quince and grate them. I use the grater on the food processor for this as well. Quince are so hard that grating by hand would be a bit onerous. Immediately add to the limes and mix well. Add the brandy and the sugar and mix again. This will stop the grated quince from going brown. For the suet I prefer to use fresh beef suet. Although the trimming and chopping of the suet adds more work to the recipe I find the end result lighter than using prepared packet suet. If you are using fresh suet, trim off any sinewy or bloody bits, then chop the suet finely. Mix the suet and then the currants and raisins into the lime and quince mix. For the candied orange and clementine, I like to make my own. Not because I have orange and clementine growing on the farm, but because home made candied peel has much more zing than most that you buy. It is not difficult to do. Take the peel off some washed oranges with a potato peeler, until you have 50 grams. Chop it into strips or squares and put it into a small saucepan. Wash and peel some clementine until you have 50 grams of peel. Again chop into strips or squares. Add to the orange in the pan. Add enough juice from the oranges to just cover the peel. Add 150 grams sugar. Bring to the boil and simmer for 30 minutes until the peel is brightly coloured and the liquid reduced. Add the above peel and its juice to the mincemeat mix and stir well to amalgamate. 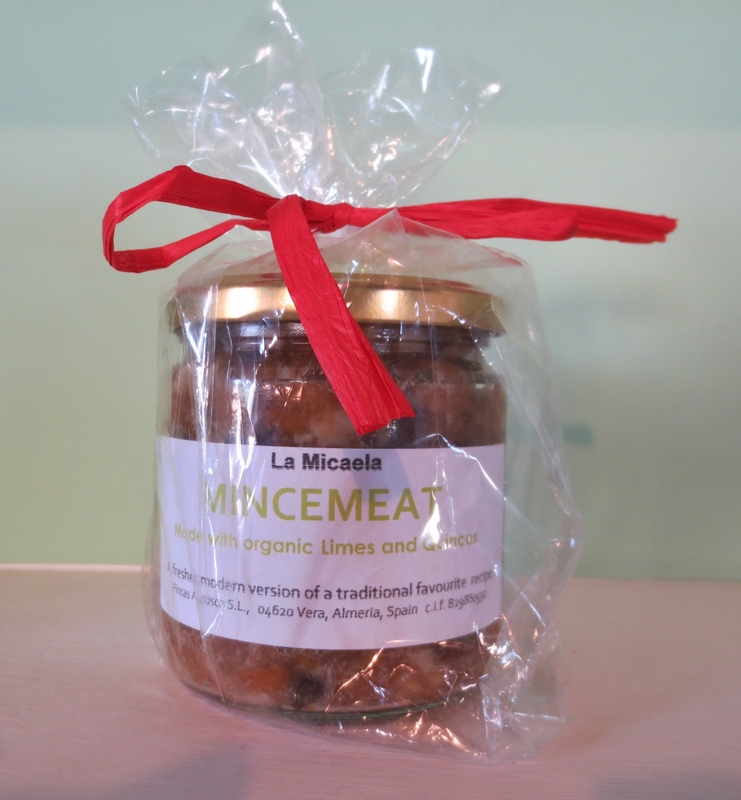 Pack the mincemeat into clean and sterilised jars. Seal. The mincemeat will look quite pale to begin with, but will darken as it matures. 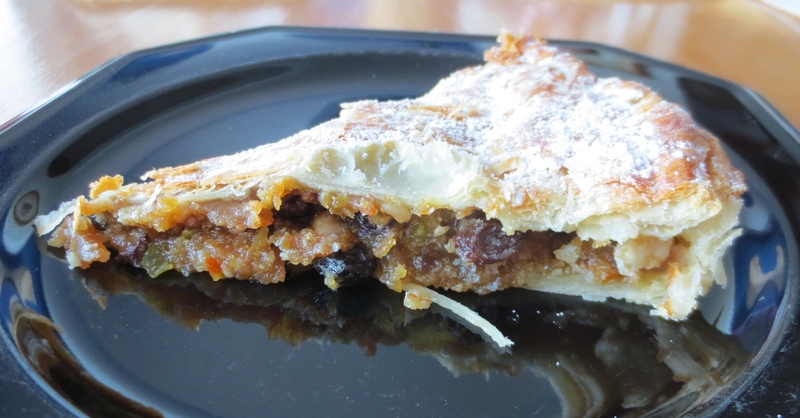 I like to make the mincemeat one year and then use it the next, although in recent years I haven’t managed that as it is so good that it all gets snapped up by friends and family. The above amount made 12 jars of 350ml capacity.